float down the river kind of day. Way too short…Autumn is beautiful, though. As an aside Beth, I just did a guest post over at Cordelia’s Mom http://cordeliasmomstill.com/2015/08/31/gramps-guest-post-by-paul-curran/comment-page-1/#comment-13020 If you have time I would be honored if you dropped by for a read. just read it , and wow! Thank you so much Beth. I am honored. I love that sonnet. In fact I love all of Shakespeare’s sonnets 🙂 Summer is a recurrent theme. Sad it’s ending, but soon we’ll have ‘Season of mists’ coming! “Sometimes too hot the eye of heaven shines”, but that river float will sure take care it. What fun! a river float cures myriad aliments. I can dream a little dream that tomorrow I would pretend to not be working and go floating lazily and happily down a river. 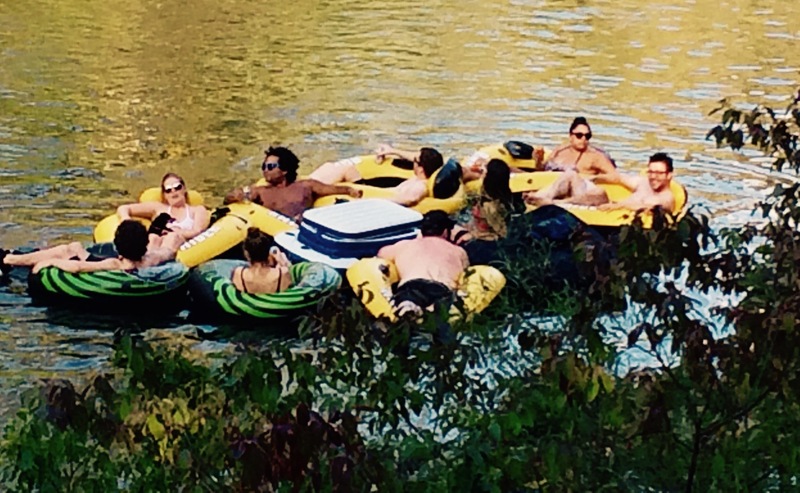 There’s nothing like floating a river with a cold one. Sigh. Hysterical… back in session indeed! Here in Delaware last weekend a few OWU students wandered into the town pool, they were having a blast on the two slides. One that Skyler is a little afraid of it’s speed. He told me he advised someone waiting at the top, he thinks it was a college boy, which slide is more fun. Isn’t this so cute and confident of him, Beth?